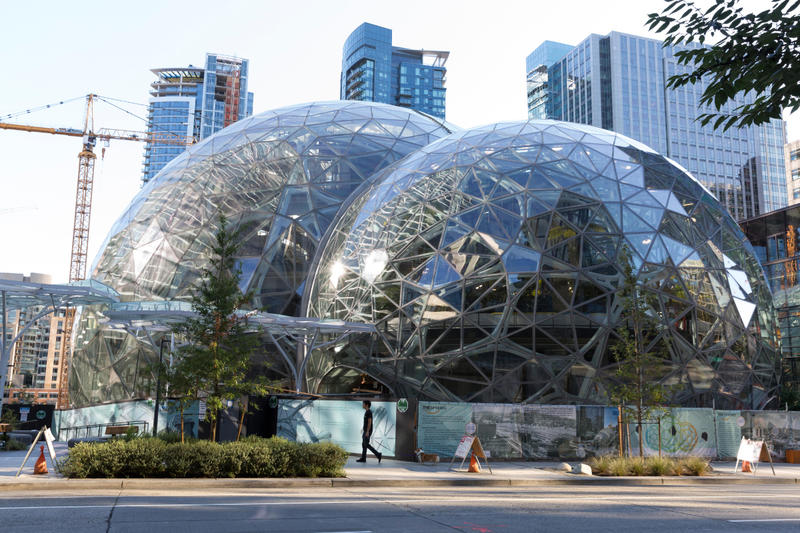 Earlier this month, Amazon opened “the Spheres” in Seattle, a transparent biodome created to house a rainforest – and, presumably, the office utilities of staffers. Four years after the company gained planning approval, the headquarters – filled with 40,000 plants from around the world – were created to provide its employees with a modern work environment that embraces natural elements. 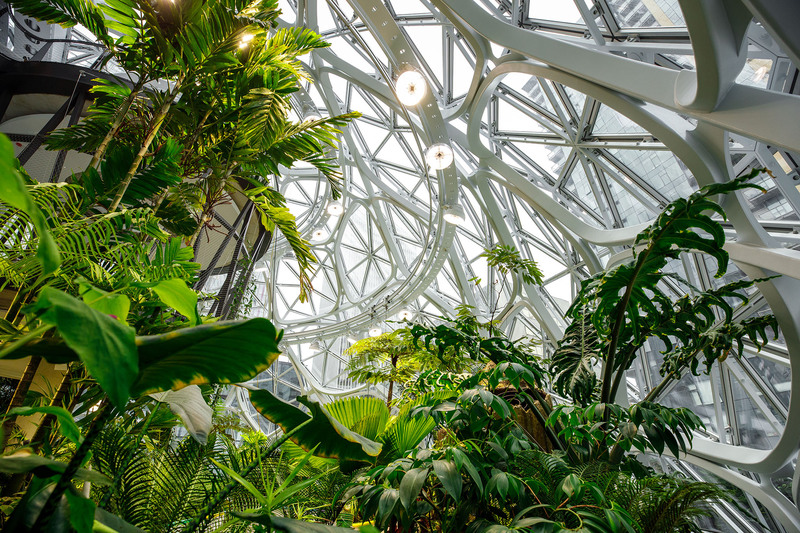 Biophilic design reconnects people with nature, and integrate nature into the modern built environment. The concept is based on the human tendency to seek out natural surroundings. 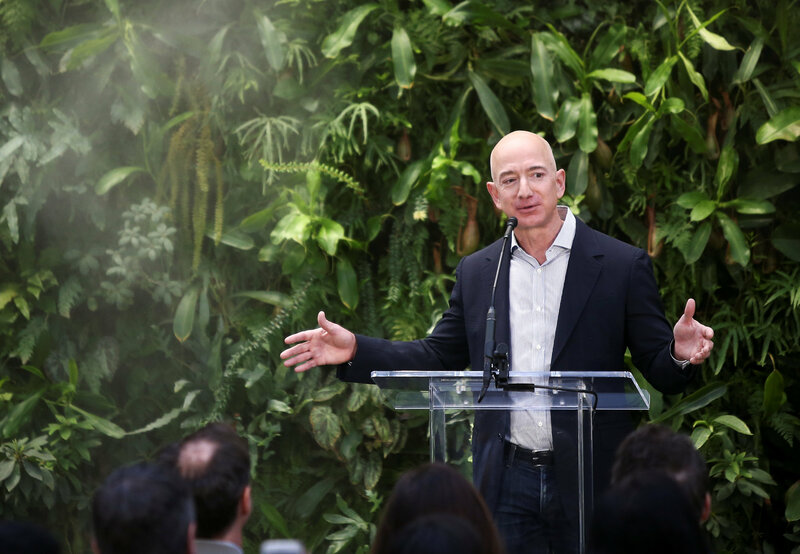 The project created more than 600 full-time jobs, and is part of Amazon’s more than $4 billion investment in the design, development, and construction of the headquarters. 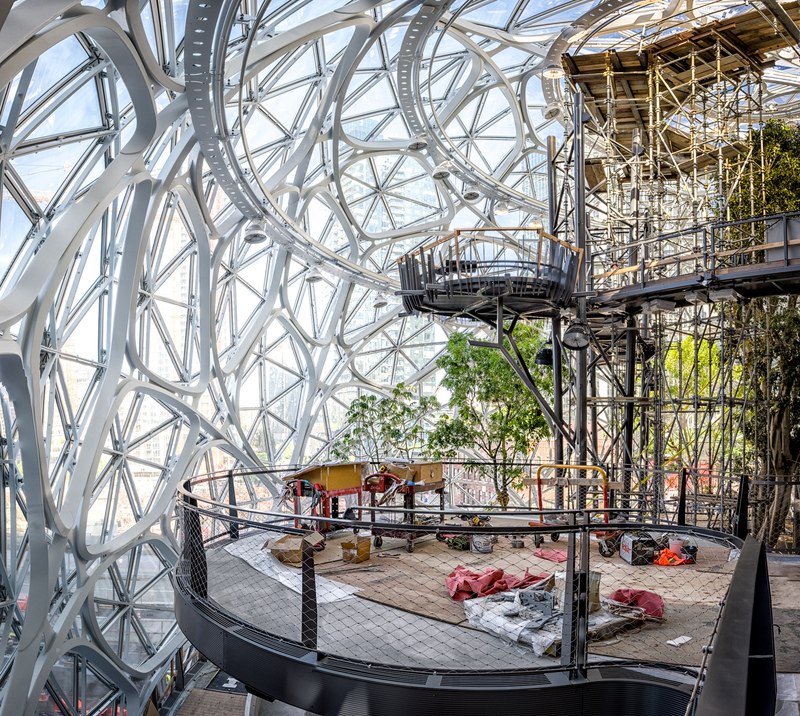 The Spheres have no enclosed offices, conference spaces, or desks, and employees can meet in treehouses suspended under 40-plus foot trees or in sitting areas and walking paths alongside cascading waterfalls. ‘The Spheres’ are a result of innovative thinking about the character of the workplace and an extended conversation about what is typically missing from urban offices – a direct link to nature. Studies suggest that spaces that embrace biophilic design can inspire creativity and even improve brain function. The Seattle headquarters are a result of innovative thinking about the character of the workplace and an extended conversation about what is typically missing from urban offices – a direct link to nature. Studies suggest that spaces that embrace biophilic design can inspire creativity and even improve brain function. 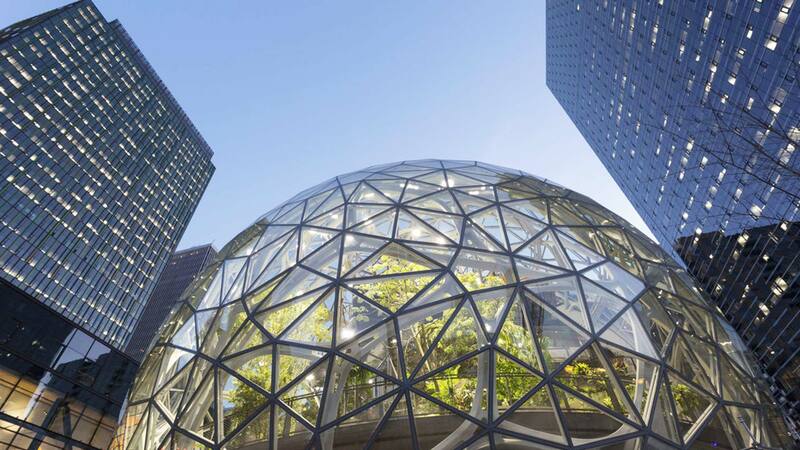 “Our goal with ‘The Spheres’ was to create a unique gathering place where employees could collaborate and innovate together, and where the Seattle community could gather to experience biodiversity in the center of the city,” Amazon vice president of global real estate and facilities John Schoettler said. The Spheres feature treehouse meeting rooms, river and waterfall features, paludariums, a four-story living wall, and epiphytic trees. They are home to more than 400 species spanning five continents and 50 countries, and many of the plants have journeyed from botanical gardens, tree nurseries, and conservation programs from around the globe. Many of the plants inside ‘The Spheres’ are from cloud forest ecosystems, where plants thrive on mountainsides at an altitude ranging from 3,000 to 10,000 feet. Plants in these ecosystems have adapted to cooler temperatures, which makes their climate needs comfortable for people, too. 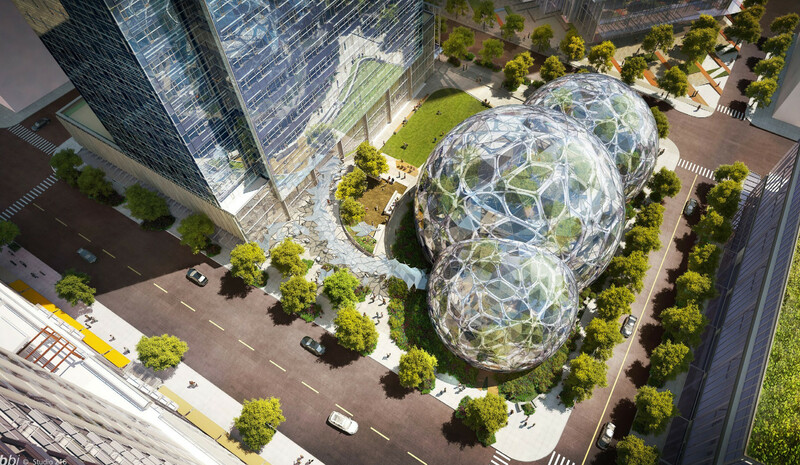 Washington State Governor Jay Inslee said he expected Amazon’s new headquarters to become an integral and landmark site in downtown Seattle. “These unique buildings are so much more than a beautiful creative space for Amazon employees.